Carol Ann Hurst Akers of Owingsville, wife of Albert Lee Akers, passed away unexpectedly after a brief illness on Thursday, December 27, 2018 at the University of Kentucky Hospital. Born April 27, 1936 in Huntington, WV, she was the daughter of the late Miles and Lyda Wallingford Hurst of Fleming County. 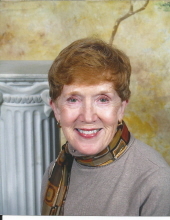 Carol Ann attended Marshall University and Ohio State University. An accomplished owner and exhibitor of Tennessee Walking Horses, she retired after many years of service to the Thoroughbred Horse Industry and medical services fields. Carol Ann was a member of Faith Lutheran Church in Lexington. Besides her husband, she is survived by: two daughters, Heather (Seamus) Nolanof New York, NY, and Melissa (Chip) Wagner of Roswell, GA; cousins, Ruth Ann Coskery Hurst, Jamie Hurst (Ron) Wiseman , Carmen Hurst (Tim) Jordan, Bobbi Jo (Chuck) Vanover, Robin Hahn Morgan, Shona Floyd Haven, Aaron Hahn, and Benjamin Durham Coskery. Service are private. Arrangements are in care of the Carpenter-Fritz & Vice Funeral Home.